All the controls you are used to having for the quote are still available, but reorganized into a cleaner user interface. Initially, the document will be formatted as a customizable quote as always. 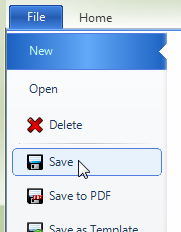 Additional options can be found on the File tab. Choose Proposal, Work Order or Invoice to apply those design templates to your document. Each has specific formatting options unique to that template. Some of this information, like “invoice number” and “terms and conditions” come from new project properties which can be modified by clicking the Customer button on the new ribbon. Printed your work order and now need an invoice? No problem. If you would like to retain any customizations you made to the work order, first choose Save on the File tab. Then, choose the Invoice template from the New option. You can always reapply the saved work order formatting later using the Open option. Where are my form templates stored?